Description: Twelve-day residential workshop-retreat focused on creating a more compassionate life, through opening the heart, informing the mind, developing our innate qualities of sensitivity and compassion, and putting that compassion into practice by reducing our harm footprints and increasing our help footprints in all spheres of life. The primary emphasis in this programme is on identifying areas of our lives where we need to change and grow in order to become more compassionate citizens of the world and more effective agents of positive change. For more details and the application form, see the Dharmalaya Institute’s website. Description: Volunteer opportunities at the Dharmalaya Institute, open to both residential and non-residential participants (though, during the monsoon, we highly recommend staying on the Dharmalaya campus). During this period, volunteers have the opportunity to learn the arts and methods of sustainable living in the Himalayas by doing physical work related to earthen building and organic gardening. Dharmalaya is a beautiful place to get your hands dirty and learn about sustainable living and Himalayan culture in the process. Who: No formal facilitation, but as-needed guidance from Dharmalaya staff and artisans, e.g. Sidney Rosario, Raj Kumar (‘Raju’), et al. Description: Informal volunteer opportunities at the Dharmalaya Institute open to both residential and non-residential participants. 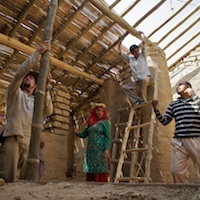 During this period, there is no structured educational or training programme as such, but there is plenty of physical work to do — including earthen building (adobe, bamboo, etc. ), organic gardening, natural landscaping and possibly some tree planting — and Dharmalaya is a beautiful place to get your hands dirty and learn about green living and Himalayan culture in the process. Who: Mark Moore, Sourabh Phadke, et al. A week-long mindful adventure in sustainable and compassionate living, providing opportunities for exploration of both inner and outer sustainability. We will practice meditation not only sitting on the cushion but also in action, performing mindful service work doing organic gardening, eco-friendly earthen construction, and natural landscaping around the beautiful Dharmalaya campus. Space is limited, so advance registration is required. For information and registration, use this form. Who: Facilitated by Mark Moore, Raj Kumar (‘Raju’), Naresh Kumar Sharma, et al. For more information see Dharmalaya’s volunteer page, read the FAQ, and then complete the volunteer application if you’re interesting in joining. Since there is no formal instruction during this period and there is no organised programme, one simply jumps in and does whatever needs doing on a given day, learning by watching others and then doing it yourself. In such an unstructured or loosely guided situation, sometimes one needs to ask for help if one needs it, so a certain degree of self-motivation and initiative makes for the best experience. It also helps to bring a healthy sense of flexibility, since the work to be done might vary from one day to the next, depending on circumstances. If that appeals to you, you’re welcome to come and go anytime during this period. For more information see Dharmalaya’s volunteer page, read the FAQ, and then complete the volunteer application if you’re interesting in volunteering. Facilitators: Mark Moore, Sourabh Phadke, et al. Description: A ten-day inner/outer adventure in sustainable and compassionate living, providing opportunities for hands-on learning of various skills and concepts related to traditional earthen building, organic gardening, and natural landscaping, integrated with mindfulness, meditation and other inner explorations. Cost: Rs 1200 per day (Rs 12,000 total) including comfortable tent/dormitory accommodation and healthy meals. For details and registration, visit the Dharmalaya Institute’s website. Please note: Space is limited, so advance registration and deposit are required. Description: Informal volunteer opportunities at the Dharmalaya Institute open to both residential and non-residential participants. 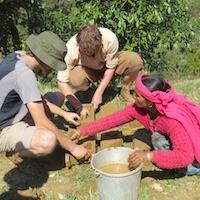 During this period, there is no educational or training programme as such, but there is plenty of physical work to do — including green building, organic gardening, natural landscaping and possibly some tree planting — and Dharmalaya is a beautiful place to get your hands dirty and learn a bit about green living and Himalayan culture in the process. Since there is no formal instruction during this period and there is no organised programme, one simply jumps in and does whatever needs doing on a given day, learning by watching others and then doing it yourself. In such an unstructured or loosely guided situation, sometimes one needs to ask for help if one needs it, so a certain degree of self-motivation and initiative makes for the best experience. It also helps to bring a healthy sense of flexibility, since the work to be done might vary from one day to the next, depending on circumstances. If that appeals to you, you’re welcome to come and go anytime between 1 December 2013 and 15 March 2014. Please note that this is the winter season, so bring warm clothes. For more information see Dharmalaya’s volunteer page, read the FAQ, and complete the volunteer application if you’re interesting in joining. Description: Informal, semi-structured programme at the Dharmalaya Institute open to both residential and non-residential participants. We will be doing fun, physical work, including green building, organic gardening, tree planting, and more. There will be plenty of opportunities for learning, application, questions, and relaxation (we can also offer an optional meditation programme for those who are interested, at least through 30 November, and possibly later). Feel free to come and go anytime in November 2013 (and you can stay even longer if you wish to participate in our Open Volunteer Programme).